2. Ask God to give you a willing heart, along with His understanding and wisdom, as you read the Bible. 3. Purchase a Bible you can understand – there are several versions available, we recommend the NIV – NLT – NKJV (The Message Version ONLY for down to earth “reading” not in depth studying). 4. Set aside daily quiet time with God, in a place without any distractions (preferably first thing in your morning). 5. Read 2 Timothy 3:16-17 and Psalms 32:8. Foundation Study Verses. 6. Have a Journal or Notebook handy so you can write down any thoughts, questions, or new revelations you receive as you study. Why we need to study the Bible: 1. The Bible is an instruction manual. 2. It will explain the “How To’s” 3. God speaks to us through His written Word. 4. It is totally reliable. 5. There is no problem in life which the Bible doesn’t provide wisdom. 6. God’s Word is the truth. 7. It is not a good luck charm. 8. Read it, study it, and apply it to your life. 9. Memorize and meditate on God’s Word. 10.It shows us “how to” overcome sin and harmful habits. The bible is a book that is totally reliable and useful for every person. The Bible is not a good luck charm. Having a copy in a prominent place in your house will not rub off on a family. Like any book, the Bible will profit you only if you read it, study it, and apply it to your life. Imagine God going to all the trouble to save us and then say, “You’re on your own! Look to the world and maybe you’ll figure out how to get through life! There is no problem in life for which the Bible does not provide God’s wisdom. God’s Word is the truth. It conveys to us God’s wisdom. The Bible is like the instruction manual you get when you buy a new computer. The manufacturer explains to you how to operate the equipment for best results. It would be foolish to spend a lot of money on a new computer and then ignore or even worse, violate the manufactures instructions. The fact that the Bible is profitable for teaching implies that it is necessary to study it. God chose to communicate His truth in written form. You must expose yourself to scripture. You don’t catch it by reading a few favorite texts (verses) every now and then. You need to hear it taught by faithful teachers/preachers. Find a place letter here You need to read it over and over. You need to study it in more depth; you need to memorize key verses and meditate on God’s Word. A Word doesn’t just point out where we’re wrong and leave us there. It also tells us how to get right with God, with others, and ourselves. It helps restore us to the proper path of God’s ways. When we become aware of sin in our lives, it tells us how to confess it and tell us how to overcome harmful habits. You need to read it over and over. You need to study it in more depth; you need to memorize key verses and meditate on God’s Word. A Word doesn’t just point out where we’re wrong and leave us there. It also tells us how to get right with God, with others, and ourselves. It helps restore us to the proper path of God’s ways. When we become aware of sin in our lives, it tells us how to confess it and tell us how to overcome harmful habits. • Where do I start reading? What Book of the Bible? You need a reading plan to keep you motivated and on track. The first book to read in the New Testament is the Gospel of John. After reading John, move on to the other gospels – Matthew, Mark or Luke. Next read Philippians, Ephesians and Colossians, which provide practical encouragement and instruction for living the Christian life. Psalms is filled with heartfelt prayers that offer encouragement for every season of life and Proverb is the book of Wisdom. • How long do I read / study? Read a little every day. Getting God’s Word into your life doesn’t have to take long. Start small—five or 10 minutes is better than none. Sometimes less is more, especially when reading less means you’ll actually remember more. • What is the difference between “reading and studying”? Reading is basically something you do for enjoyment while studying means to gain knowledge or skill, to memorize facts, while gaining knowledge. What happens when I don’t understand what I am reading? As you read, you’ll find one or two verses that seem to leap off the page. Maybe they give you comfort or encouragement. When a verse resonates with you, stop and write it down, word for word. Pause to let the message sink in because these words are God’s words to you. Ponder on it through out your day. This verse may be the major encouragement or direction you need for the day. • What if I don’t remember what I just spent time reading? I’ve got faith that God will honor the time we spend in His Word, and He will put His Word in our hearts even if we can’t remember verses word for word. Trust God to bring His Word to your remembrance when you need it. Don’t get discouraged! Keep on reading and studying, you’re learning more than you think! • How will reading/studying the Bible help me? God’s Word leads us to salvation -We are all saved by believing the truth of Scripture- (1 Peter 1:23). The Scriptures guide our steps. Psalm 119:105 says, “Your word is a lamp to my feet and a light to my path.” If we read and heed the Lord’s instructions, He will show us where to go, what to say, and how to make decisions. His Word also reveals when we’re heading the wrong direction and warns us of the consequences of continuing down that path. God’s Word directs us to wisdom. Scripture is our greatest protection. It’s like a shield before us, guarding our way and warning of danger. But if we neglect reading and obeying the Word, we won’t be able to distinguish right from wrong. The Word of God brings joy. If we love the Word, we’ll find great joy and comfort in reading it (Ps. 119:111). When facing tough situations and discouragement. Even if we don’t know where to read, the Lord will guide us to a passage which can restore our hope and joy. And if we don’t have a Bible with us, He can bring to mind the verses that we’ve stored in our hearts. 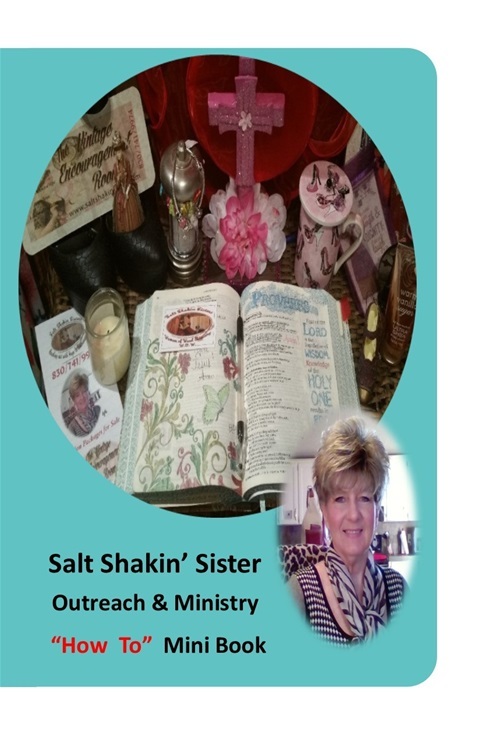 Reaching out to encourage women of all faiths; the churched and unchurched. Barbara F Chapmonds Testimony— I “had” a Religion, I “was” Religious then, I “got” Saved. When I was a young child I “had” a Religion. I remember my parents taking me to church on Sundays as a family, this was a weekly routine. When I became a teenager, I “had” another, new Religion and I went to church with my best friend every time the doors were open. In my church going experiences I remember “hoping” Jesus would come when I was in church, that’s because I was not sure about my relationship with Jesus, (I wasn’t saved, only thought I was). I remember being “religious” and talking the talk. I was good at telling people what they should and shouldn’t do to stay out of hell. I really thought I was saved and on the right track, you could not tell me any different!! Having an “experience or seeing a light” is not “salvation”. You must admit you're a “sinner” and “confess” your sins to Jesus and ask Him to personally “come into your heart. You don’t have to “change first or clean up first”. Just trust Him from your “heart” and He will do the rest, as you grow in your relationship with Him.”. Before I got saved, I don’t remember sharing the “Love of Jesus” or even leading anyone to Jesus. I was “blinded by the devil” and caught in the “Religious Trap”, like so many are. Satan also knows the Bible; he can make things “Look Godly” when they’re not! When I was a teen, and even up until I “really got saved” at the age of 27, I was taught you could lose your salvation. Oftentimes, you will hear people say they are “backslidden” or they got saved one time, but they aren’t now. They only “Hope” they will go to Heaven. It doesn’t have to be that way, you don’t have to go down that “trail”. When the Holy Spirit started dealing with me about salvation, I was in a church revival service. The only other people attending, were church members. I thought to myself, “why are they preaching on salvation, everyone here is saved”. I was uncomfortable with the preaching, so I thought, maybe God is talking to me and I need to get saved (remember, I thought I was, for years). “PERSONAL SAVIOR”? You can! Ask Him right now, don’t put it off any longer. I remember quietly, and only to myself, while sitting in the pews saying, “Ok Lord Save Me” amen. That didn’t do anything for me. In my soul, there was a “black, dark space” an empty place that needed something, I just didn’t understand what it was. That evening, I went next door to a church members home, I sat on the floor around the coffee table and talked to her about my life. For about two hours, it was a fight in my spirit/heart, I had to “give up” my good deeds/ works and confess I was really a sinner and needed Jesus. I remember ONE QUESTION my friend asked me, “What has Jesus done for you, you told me what you’ve done for Him, but what has He done for you? You talk about Jesus and the Holy Spirit getting my attention! So, I prayed, gave all my good deeds to Jesus, confessed to Him I was a sinner and I needed Him to come into my heart and save me; by faith, not counting on any “feelings”. That’s it! So, simple, but it was from my HEART, not my head knowledge this time. Jesus saves “one time” and He seals and keeps you as His child forever. (Read the Book of Ephesians, you will understand salvation and being sealed by the Holy Spirit of God within you, a lot better. The first book written in this ministry was on Ephesians) After salvation, we need to get into Gods Word, ask Him to show us how to live, follow His instructions and bear fruit. That means there will be a change in our hearts, attitudes, friends, places we go, and things we say. The Holy Spirit will guide you. DO YOU KNOW JESUS AS YOUR SAVIOR? Talk to Him today, He is waiting on you and loves you! Matthew 5:13– We are the SALT of the earth...be a light and share Jesus with everyone.